You can use ALL the ideas and resources, or you can pick one or two things from the Kit and easily implement those. All funds raised by your children for our children will go directly to help the children, teens, and families we serve in our Decatur campus and in our District Offices, all over North Georgia. So your children will help children in their own community. We need to empower the children of the North Georgia Conference to be a part of God’s work at UMCH! THEY do the fundraising, not you, and not the parents! You can hold a Movie Night, a Car Wash, or take orders for pizza, Chick-fil-a, or any local restaurant for your Friday Picnic Celebration, add a dollar or two, and donate that. Children can play the violin in carpool, sell coffee in the drop off line, or make homemade dog treats to sell to church members. We want to hear about your creative ways to raise money for UMCH! 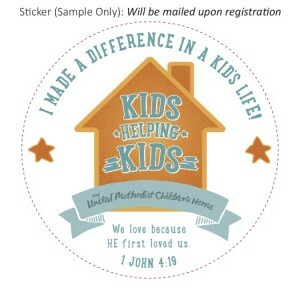 Whatever you do, we know God will bless it!For questions about the Kids4Kids VBS Mission Kit, please contact The Rev. Teresa Angle-Young, tangle-young@umchildrenshome.org, 404-327-5837. You may download the free mission kit here. As you can see, the need has never been greater. But we are encouraged because of the love you show our children and families, and because we know that together, with God’s help, we can bring transformative, healing grace to a hurting world. Thank you so much for your support of The United Methodist Children’s Home!